The Texas Rangers head to Angel Stadium on Friday to take on the Los Angeles Angels. Martin Perez is the probable starter for the Rangers and he'll face Garrett Richards of the Angels. The opening line for this matchup has Texas at +145 and Los Angeles at -155. The over/under was set at 8. The Rangers, with a 81-51 run line record, cover the spread 61% of the time. They also have a 57-67 over/under record. The Angels are 57-76 against the run line and have a 64-64 over/under record. They cover the spread 43% of the time. The Rangers come into this game with a 70-62 record, and they are 38-30 away from home. Martin Perez has a 2-3 record on the season, an earned run average of 5.15 and a 1.44 WHIP. The Rangers are 5-3 over his 43.2 innings pitched and he's also given up 52 hits over that time period. Their record against the over/under when he starts is 3-5. He is getting 4.9 runs from the team when he takes the mound. The bullpen has an earned run average of 4.46 and they have given up 410 base hits on the year. Opposing teams are hitting .253 against the Rangers bullpen while walking 172 times and striking out 371 times. Texas is averaging 6.74 strikeouts per game while getting 9.19 hits per nine innings as a team. They rank 25th in baseball in team earned run average at 4.34. As a team, Texas is batting .257, good for 9th in the league while putting together a .243 average away from home. The Rangers hold a .409 team slugging percentage and an on-base percentage of .320 which is good for 12th in baseball. Prince Fielder leads the team in hits with 157 while the team ranks 10th in baseball with 8.77 hits per game. With a 67-66 overall record, Los Angeles will come into this game 39-27 at home. Garrett Richards has a record of 12-10 while sporting an earned run average of 3.80 on the year with a 1.24 WHIP. The Angels have a record of 14-11 over the 161 innings he's pitched during which he's given up 149 hits. Their record against the over/under when he starts is 15-10. He is getting 4.1 runs from the team when he takes the mound. The bullpen has an earned run average of 3.80 and they have given up 365 base hits on the year. Opposing teams are hitting .246 against the Angels bullpen while walking 125 times and striking out 339 times. Los Angeles is averaging 8.78 strikeouts per game while getting 8.19 hits per nine innings as a team. They rank 4th in the league in team earned run average at 3.37. As a team, they are batting .252, good for 18th in the league while putting together a .256 average at home. The Angels hold a .418 team slugging percentage and an on-base percentage of .326 which is good for 4th in baseball. 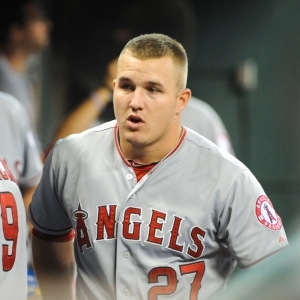 Mike Trout leads the team in hits with 141 while the team ranks 26th in baseball with 8.33 hits a game. Texas has a team fielding percentage of .981 after having committed 94 errors with 1,356 assists and 3,536 put outs for the season. The Angels have committed 79 errors on the season with 1,226 assists and 3,548 put outs leading to a team fielding percentage of .984 on the year.